We have put together a solid yet simple menu offering a wide choice at good value. We regularly update our menu, based on client feedback and inspiration from our own travels. 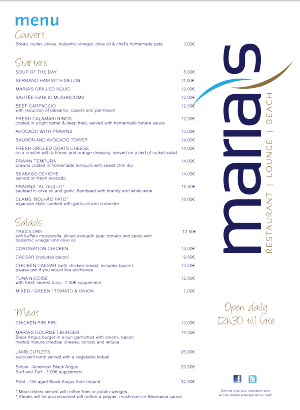 We believe a meal at Maria’s should be an unhurried pleasure; whilst you take in the atmosphere and views, we take time in serving you good quality, freshly cooked food. Much of our produce is sourced locally and with our portuguese partner’s cousin being the largest fish distributor in the Algarve, we know we are guaranteed the best fish delivered daily. We have a daily specials board and our large variety of cakes and desserts (all made in-house) are extremely popular. We have a childrens menu and we cater for food intolerances (please ask your waiter). 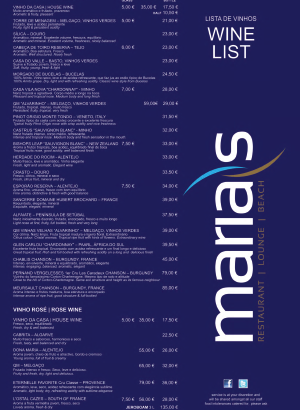 We work very closely with our wine suppliers and our wine list is hand-picked by the owners. It boasts a delightful range of carefully selected portuguese and international wines to complement the menu items. Our Rose L’Ostal Cazes has been bottled in 6ltrs, 3ltrs and 2ltrs, especially for Maria’s by the vineyard.